The American Hellenic Institute, Inc. (AHI) was founded on August 1, 1974, following Turkey’s invasion of Cyprus with the illegal use of American-supplied arms in violation of U.S. laws and agreements. The AHI initiated the rule of law issue in the Congress in the interests of the U.S., thus changing the face of American politics. When Secretary of State Henry Kissinger and the United States Congress would not act to enforce U.S. laws following Turkey’s invasion of Cyprus on July 20, 1974, AHI called on some of its friends in Congress. AHI wrote to them on August 28, 1974, setting forth Turkey’s violations of the U.S. Foreign Assistance Act of 1961 (FAA) and the Foreign Military Sales Act (FMSA) in its invasion of Cyprus with the illegal use of American supplied arms and equipment. Our friends in Congress adopted our arguments and sent a letter to Secretary Kissinger on August 29, 1974. Thus the rule of law issue was born. It should have been born the very day Turkey invaded Cyprus—July 20, 1974—and if it had been, there would have been no second aggression on August 14, 1974. Kissinger violated the FAA and FMSA and his constitutional oath of office to faithfully carry out the laws of the land when he refused to declare Turkey “immediately ineligible” for further U.S. aid and sales as required by law. After a dozen major votes in the Congress between September and December 1974, in which the entire community was active in support of the rule of law, Congress passed an arms embargo against Turkey. AHI coordinated the effort in the community, kept a vote count on a daily basis and provided the information to key supporters in the House and Senate. It was an historic success that should never be forgotten. It proved what could and can be done when we are in the right and united on policy. Fundamental to the success was the fact that we stood for the rule of law in international affairs as in the best interests of the U.S.
Also in December 1974, AHI initiated the proposal for $25 million in humanitarian aid for Cyprus, which was adopted by our friends in Congress. As a result of that initiative, supported annually by AHI, Cyprus has received over $400 million which has aided the island’s remarkable economic recovery. In the years since 1974, AHI has kept the spirit of the rule of law alive. AHI and its affiliate organizations have championed the rule of law and American values in foreign policy as in the best interests of the U.S. This is especially true in Southeast Europe and the Eastern Mediterranean, a region critically important to American national interests. The American Hellenic Institute Public Affairs Committee, Inc. (AHIPAC) was established in early 1975 with a charter similar to AHI’s. While both AHI and AHIPAC are authorized to lobby, AHIPAC was formed to concentrate on lobbying. AHIPAC is the only Greek American organization registered with the U.S. Congress under the Lobbying Act. The American Hellenic Institute Foundation, Inc. (AHIF),established in 1975, is a 501(c)(3) non-profit tax-exempt educational and research organization and is the first “think tank” devoted exclusively to the study of the issues confronting the Greek American community. The AHI Business Network, a division of AHI, was initiated in 1989 creating a national and international network for the Greek American business and professional community, and putting it to work helping other Greek Americans. Its purpose is to share business information and contacts. Its concept is people helping people by sharing experience, knowledge and ideas. In 1995, the Foundation for Hellenic Studies was established in Washington, D.C. under the auspices of AHIF and under the direction of Professor Van Coufoudakis, who is dean emeritus and professor emeritus at Indiana University—Purdue University in Fort Wayne, Indiana. The foundation’s main objective is to provide support to qualified individuals, institutions, programs and projects advancing the study of Greece and Cyprus in the U.S. Through the years, AHI has grown into one of the key Greek American membership organizations. Below you will find descriptions of some of the programs and publications the AHI and its affiliates have developed over the years to strengthen relations between the U.S., Greece and Cyprus and within the Greek American community. AHI has embarked on a program to develop its chapters across the country to better facilitate the grassroots activities of the AHI and its affiliate organizations. This program includes meetings with and letters to elected officials, contacts with the media and academic community, and organizing newsworthy events. AHI works in close cooperation with the Order of Ahepa, the Hellenic American National Council (HANC), the Hellenic American Women’s Council (HAWC) and the various regional societies. In 1994, President of HANC Ted G. Spyropoulos announced that it designated AHI to coordinate lobbying efforts in Washington with the Congress and the Executive Branch on issues concerning the U.S., Greece and Cyprus. AHI has periodically initiated legislation on the key issues of Cyprus, the Aegean, U.S. relations with Turkey, FYROM, and the Ecumenical Patriarchate. AHI successfully ended grant aid to Turkey and helped to pass: (1) H.R. 4545—Visa Waiver for Greek citizens, passed into law on March 25, 1999; (2) S. 1607, a bill applying a code of conduct to U.S. arms supplies to non-democratic countries including Turkey; and (3) Section 2804 of the 1999 Appropriations Law, calling on Turkey to respect the Ecumenical Patriarchate and reopen the Halki Theological School. In 2004, Representative Frank Pallone, Jr. (D-NJ) introduced the American-Owned Property in Cyprus Claims Act, H.R. 5071, which was initiated by AHI. If passed, this bill would enable U.S. citizens who own property in the Turkish occupied territory of Cyprus to seek financial remedies against either the current inhabitants of their property or with the Turkish government. And in 2006, Senator Olympia J. Snowe (R-ME) introduced the Senate version of the American-Owned Property in Cyprus Claims Act as S. 3520, along with her colleague Senator Robert Menendez (D-NJ). The AHI initiated the annual Greek American Policy Statements on issues concerning U.S. relations with Greece and Cyprus. The Policy Statements are authored by AHI and have been reviewed, edited and approved in past years by the Order of the Ahepa, the Hellenic American National Council, the Hellenic American Women’s Council, the Cyprus Federation of America, the Panepirotic Federation of America, the Pan-Macedonian Association of America and other organizations. Distributed to the members of the House, Senate, and the Executive Branch, the Policy Statements present a unified Greek American position on the issues of concern to the community. AHI periodically issues a Candidate Questionnaire on issues of concern to Greek Americans, also asking them to answer policy questions. Also issued periodically are House and Senate Score Cards for Greek American issues which provide the voting records of the House and Senate members on issues regarding U.S. relations with Greece and Cyprus. In 1998 and 2000, the AHI Candidate Questionnaire was distributed to all candidates in the House and Senate. In 2006, AHI drafted and distributed the 2006 Questionnaire for Congressional Candidates to those running in the 2006 mid-term Congressional elections to score their positions on issues important to the Greek American community. AHI has organized a CCLT program which to date has at least one grassroots contact in over 400 of the 435 congressional districts and with 98 of the 100 U.S. senators. The goal is to develop at least five contacts with each of the members of the House and Senate. The CCLT has played a leading role in the success of the bills in Congress. AHI members across the country have participated in letter writing and phone campaigns to their respective members of the House and Senate. AHI has made a special effort to involve the numerous Greek American communities who responded with petitions and letters to their elected officials in a strong show of support. AHI has kept the community informed of actions in Washington and provided information and guidance on reaching their members of Congress. AHI has hosted a number of receptions, luncheons, dinners and briefings for visiting dignitaries from throughout the United States, Greece and Cyprus in order to promote dialogue and cooperation between these countries. Each year, AHI hosts its major fundraising event—the Hellenic Heritage Achievement and National Public Service Awards Dinner. AHI takes tremendous pride in paying tribute to a distinguished group of individuals for their important career achievements and for their contributions to the Greek American community. Past honorees have included: world-renowned musician Yanni, prominent businessman and philanthropist George Behrakis; former CIA Director George Tenet; George Stephanopoulos, chief Washington correspondent for ABC News, anchor of ABC’s This Week and former senior advisor to President Clinton; Fox Filmed Entertainment Chairman James N. Gianopulos; AOL Vice Chairman Ted Leonsis; Senators Paul Sarbanes, Olympia Snowe, and Joseph Biden; Congressman Michael Bilirakis; and former U.S. Ambassadors to Greece Nicholas Burns and Thomas Miller, to name just a few. Also honored were two long-standing Greek American organizations: The National Philoptochos Society and the Daughters of Penelope. Prominent members of the Greek American community from both the U.S. and abroad attend the gala each year, making it an important event through which guests can celebrate the successes and achievements of our community together. In 2004, AHI dedicated the gala dinner to the Athens 2004 Olympic Games. A special segment during the evening paid tribute to three former Olympians by awarding them each with the Hellenic Heritage Achievement Award. Over the years, AHI has organized over 60 conferences on legislative policy and how to lobby the Congress on U.S. foreign policy regarding Greece and Cyprus. In November 1999, AHI held its inaugural conferences in Nicosia and Athens. The conference was titled “U.S. Relations with Greece and Cyprus: The American Foreign Policy Process and the Role of Greek Americans.” The participants learned about the issues and how the foreign policy legislative process operates in the U.S. To analyze the state of the Greek American community, AHI launched its first annual conference on “The Future of Hellenism in the United States” in 2002. The conference, which continues today, features an expert line-up of speakers from the community and travels to a different city each year. Through its many years of dedicated service to the Greek American community, AHI has been recognized for its achievements and efforts promoting strong U.S. relations with Greece and Cyprus, and within the Greek American community. In 2004, Gene Rossides received the Commander of the Order of the Phoenix from Greek President Konstantinos Stefanopoulos for his commitment to supporting Greek national issues, largely through his work at AHI. And in 2006, AHI was honored with the Greek Letters Award by the Three Hierarchs Parish in Brooklyn, New York, on the occasion of Greek Letters Day. 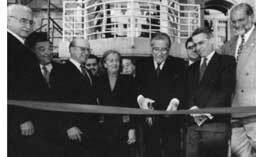 AHI organized the first U.S.-Greece-Cyprus Trade Conference in 1975 and has held a total of 16 such conferences, including nine seminars between 1998 and 2000 titled “Cyprus: An International Business, Shipping and Financial Center.” A key part of AHI’s program is to strengthen business ties between the U.S. and Greece and between the U.S. and Cyprus. The AHI Membership Directory of members around the world, indexed by profession and geographic location, has been used as an everyday tool to generate greater interaction among our members and to stimulate participation in business networking.